Of all the recipes I’ve done over the years, this Chocolate Caramel Bar dessert by far has been the most popular. I have sold a lot of afternoon tea room cookbooks, because of this basic recipe. The one posted here is a newer version than any of the versions in my afternoon tea cookbooks. First there was chocolate, next came caramel and now – Sea Salt Caramel. It all started out with the name, “Choc Bars.” I received the original version from a co-worker in college on my very first week of work. I was a student new hire answering the phones in German at my American University (University of Maryland) in Munich, Germany. This gal (I can’t even remember her name, how terrible!) brought a plate of these in. It was all I could do not to eat them all! They were so addictive! She gave me the recipe and I have been making a version of them ever since. 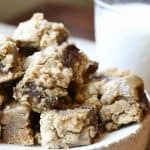 When I opened my tea room back in 2003, I renamed them, “Chocolate Oatmeal Delights.” I thought it sounded better for a tea dessert than, “Choc Bars.” They were a huge hit and one of our most highly requested desserts. A few years later I decided to add a caramel layer with pecans. Those were even more popular! And then today for some reason this morning it hit me, why not add some sea salt and make Sea Salt Chocolate Caramel Bars? Let me know what you think! You can always leave the caramel and the sea salt out, but why would you do that? So why is this recipe on Gourmet Done Skinny? This is the first recipe I’m posting in the, “Not So Skinny,” category. You know I’m all about taste. I don’t want fat free, sugar free, no taste junk. If I’m going to spend my Weight Watcher points, it better be good. This is worth it! Of course I cut the bars into tiny squares and they are tiny. But it’s nice to have a treat now and then. And the good thing is, that you know the point value. You don’t have to eat the whole pan! You can freeze them for later! Yes, You can make them, cut them into squares and freeze them. Of course they are not as good as fresh, but it saves you from eating the whole pan at once and you can dole yourself out a nice treat when needed. Decadent Gooey Sea Salt Chocolate Caramel Bars, need I say more? They are easy to make, and you won’t believe the reaction you get when people take a bite! My favorite way to make these is to line a 9×13 pan with parchment paper. Then spray with cooking spray. It makes them so easy to flip over when they are cooled and cut into small squares. You can also just bake them in a 9×13 and cut in pan. Cream together 1 c. butter, 2 c. brown sugar and eggs. In a separate bowl, combine together flour, salt and baking soda. Add to creamed mixture. 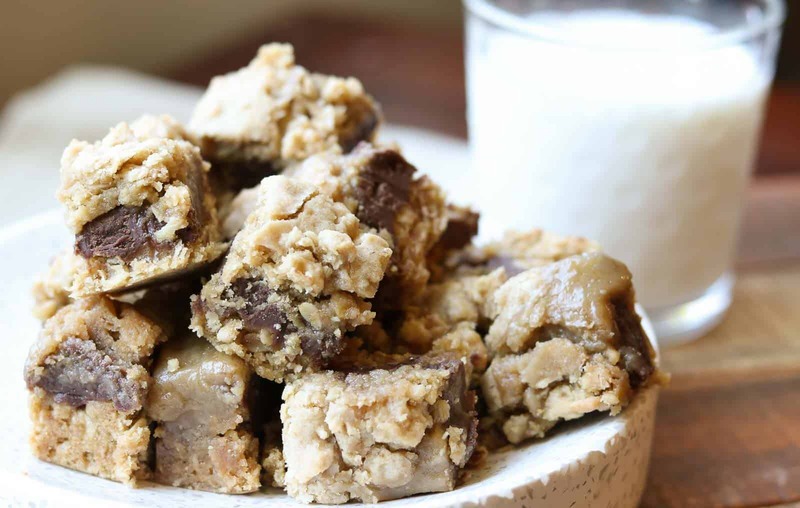 Melt together chocolate chips, and sweetened condensed milk. You can do this on a stove on low heat or in the microwave, 30 sec at a time, stirring well before microwaving again. Pour chocolate mixture over oatmeal mixture. In a saucepan, combine 1 c. unsalted butter and 1 c. brown sugar. Bring to a boil and boil for 2-3 minutes stirring constantly. Use a timer, start the timer when the mixture begins to boil. The mixture will get bubbly, foamy and thick. Turn off heat. Add vanilla. Immediately pour over chocolate layer. Sprinkle chopped pecans over caramel layer. Sprinkle lightly with sea salt. Crumble/chunk the reserved oatmeal mixture on the top of the chocolate mixture. Bake at 350 degrees for 18-20 minutes. Do not over-bake. The top oatmeal chunky layer will be almost done, like a cookie. I peel back some of the oatmeal, if it’s mostly cooked, then it’s done. Let sit overnight or cool for at least 6 hours. Take a knife and run along the edge. Flip pan over to release bars. Peel off paper and flip over so that bars are right side up. Cut into bars. This recipe makes about 60 bars. For best results, let set overnight before cutting or at least 6 hours, otherwise they will be gooey when you try and cut them. 5 Replies to "Sea Salt Chocolate Caramel Bars"
I think we’ve tried there your holiday parties and they are fantastic! High up on my list to make in my new kitchen when it’s complete. Yes you have! These are pretty much the same, but I added some sea salt. Can’t wait to see your kitchen when it’s done! These have been one of my all-time favorites since my college days when Amy was my roommate! I lost my recipe, but now I have it back!!! Hi Alicia! Yes this is the one but I added the caramel, nuts and sea salt. If you want the old version, just leave that layer out. Sorry you lost it! I didn’t know!